So I have been going for two whole years now! And what a year it has been! 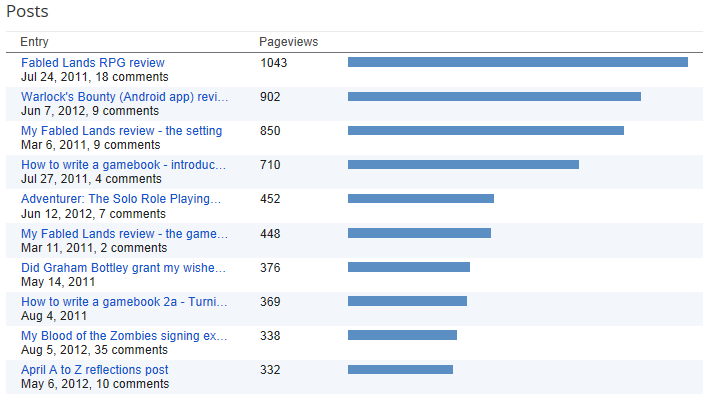 Back in January, The Tin Man wrote a post on why 2012 will be the year of the gamebook. We are only two thirds through the year and his prediction has been 100% accurate. In the past year, I've had 72324 page views and 126 posts. I was very flattered that The Tin Man also mentioned me and Lone Tiger gamebook reviews (which has been a bit quiet recently, apologies) as part of the rise of the gamebook blog section. gamebook blogs have certainly sprung up all over the place this year and this has led to a gamebook Great conversation on the web. I enjoyo the dialogue that I have with all of you wonderful gamebook readers and bloggers and it makes blogging an even mopre joyous experience. I'd like to thank everyone in the gamebook world that I have met through this blog. It has been a priviledge to speak to you all and your constant support and encouragement makes feeds my enthusiasm even more. Since last August, I have written posts and I have had page views. My Twitter account now has over 1000 followers (Kathy Lynn Hall helped with that). My Facebook group now has 24 followers and my Youtube channel now has 10 videos. Did I deliver on my aims from last year? Last year, people asked for more pictures, vlogs and flavour text. I managed to deliver on the pictures and vlogs but not on the flavour text. Two out of three ain't bad, I guess. What have I learnt from this blog? I haven't really changed my MO over the past year. 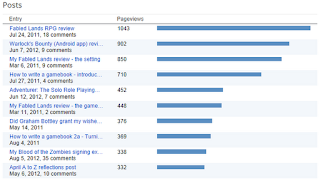 When I can, I have left comments on other blogs and I have emailed some gamebook people. Blogs are more about dialogue than a one way flow of information and the more dialogue that is involved, the more rewarding it is for both parties. Now that there are more people talking about gamebooks on the internet, these rewards are getting exponentially larger :) so the lesson that I have learnt this year is to talk to people. I asked a lot of people for interviews this year and they were all very obliging. The gamebook community is very helpful and I'm very thankful to everyone who has taken the time to provide me with material this year for various things including the April A to Z. 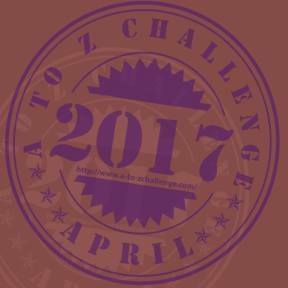 The April A to Z was worth doing again and I would recommend it to any blogger. As the stats below will show you, I went from about 5000 views in March to over 100000 views in April and then just under 8000 views afterwards which means that the April A to Z not only gets you followers in the short term but also in the long term. I also found some cool blogs to look at from the huge range on offer. The moral of the story is that if you love something, blog about it and it will take you to all kinds of great places. I wrote a list of articles that I would do back in January 2011(!) and I have not released most of them. I've released the morality one and I've written the stupid decisions one but not released it yet. The bad news is that I don't know when I will be able to release it. In face I have written tons of articles that I scheduled for the year, then reverted to draft and I don't know when I'll release them. That may sound like bad news, but the good news is the reason for why I haven't released these articles. I haven't released them because there's been so much great stuff happening in the world of gamebooks that, as the year has gone on, I have released fewer posts on analysis and more posts on current events. This is most definitely good news as it means that the world of gamebooks is thriving. As recently as 2010, felt no need to publish any posts about current affairs beyond the odd blog and the Windhammer competition so by 2011, when I was in the swing of blogging, I started stockpiling analysis articles in advance. In the short space of two years, I have gone from almost all analysis to almost half analysis and half current events. Back in 2011, I also decided to do one post a week with the occasional post if anything pertinent came up as I was worried about burning myself out or running out of subject matter to write about. I definitely won't be running out of subject matter any time soon, but I don't want to burn myself out so I'll stick to one post a week. I also want to limit my blogging for another reason: I want the time to read and write more gamebooks. My analysis has come from my childhood experiences of gamebooks and I want some more subject material to work from. I also want to write my own stuff, such as books for Pirates and Traders and also the Adventurer system. I took these stats on the 19th August, so it's not quite a year. The huge spike is due to the April A to Z and I would like to thank all of the lovely people who agreed to provide me with interview answers and made my April A to Z a pleasure to do. I would like to do one in 2013 but I must see if I have the time first. The future is looking bright for gamebooks. In the short term, the year of the gamebook is far from over. In just over a fortnight, we will be experiencing the treats that the Windhammer entrants will offer us and I'm excitied to see what they will come up with. There is still time to enter your gamebook for the chance to win a cash prize and be published by Tin Man Games! There is also the eagerly awaited second Destiny Quest book, The Heart of Fire which will be out in November and that is well worth looking forward to. 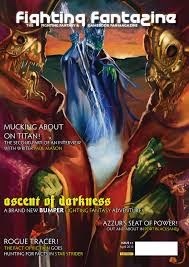 Fabled Lands 5, The Court of Hidden Faces has recently been republished and Dave Morris and Jamie Thomson and it seems that this is only the beginning. I'm sure that they will not be the only things to happen in the next four months, however, so keep em' peeled and look forward to a new wave of gamebook greatness that started in 2012 and will carry on into the future. Congratulations Stuart! I've only been following your blog for the past year, but I really enjoyed it. May your blog be a leading authority in the gamebook scene for many years to come! Congratulations! Sharing one's passion is an intensely brave thing to do, and you've succeeded in communicating yours in a professional, approachable manner. Keep up the great work, Stuart! keep writing and please, keep the tutorials!